Exomotive - US Manufacturer of Exocars & Kit Cars | Road and Track features the Exocet! 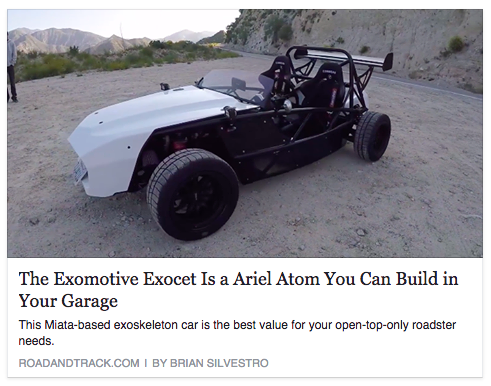 Road and Track features the Exocet! After seeing The Smoking Tires’ take on the Exocet, Road and Track seems to agree that, “all you need is a donor Miata to build the enthusiast’s car of your dreams.” Check out their take on Matts driver review here!